The grounds at Cosley Zoo offer a beautiful setting for your next event. Cosley Zoo offers a unique setting for meetings, family events, celebrations, and more! Thank you for your interest in renting a space at Cosley Zoo for your event. The following includes the various spaces, fees, amenities, and additional information for rentals at the zoo. Guests receive FREE zoo admission with any Cosley Zoo event rental. Click on tabs below to view details regarding the various rental options available. Ice Cream Novelties (available seasonally) – Starting at $2.50 each. Pitchers of Soda (includes cups) – $8.00 each. Catered Food and Beverage, Tables, Chairs, Linens, Tent Rentals, and Valet Parking – Please see our preferred vendor list for more information. Valet parking required for events over 100 guests. Ice Cream Novelties (available seasonally) – Starting at $2.50each. Alcoholic Beverages (provided and served by Arrowhead Golf Club) – Prices vary. Please see our preferred vendor list for contact information. Catered Food and Beverage, Upgraded Linens, Additional Tables, Chairs, Tent Rentals and Valet parking—Please see our preferred vendor list for more information. Valet parking required for events of 250 guests or more. To make a reservation, please contact Tami at 630.510.5040 or tromejko@wheatonparks.org. To complete a reservation, a non-refundable deposit is required along with a signed rental agreement. Your deposit is then credited towards the balance due. Deposit fees are 50% of the base rental fee. Deposits are due within one (1) week of making the reservation and can be paid by cash, check or credit card (Visa, MasterCard or Discover). The final balance is due two weeks prior to the rental date. Reservations made within three weeks of the event date are required to pay in full within one (1) week of making the reservation. Wild Bunch Plus and Keeper Club Member levels receive a 10% discount off any base rental fee if the renter is an active member at the time of reservation or if a membership is purchased before final payment is due. Discount does not apply to rental add-ons. Discount may not be used in conjunction with any other offers. Your rental coordinator will assist you with any questions throughout your planning process up until the day of your event. On the day of your event, your rental greeter will meet you upon your arrival and check-in with you 1-2 times during your event. You are responsible for all unloading, set-up, and clean-up of your supplies. Cosley Zoo does not provide a team member to assist with this. Non-profit organizations receive a 10% discount off any base rental fee. Discount does not apply to rental add-ons. A federal ID number and tax-exempt form must be submitted with the rental agreement to receive the discount. Discount may not be used in conjunction with any other offers. There are several food options when hosting an event at Cosley Zoo. You can choose anything from pizza delivery to full service catering. You may also choose to bring in your own food and non-alcoholic beverages. 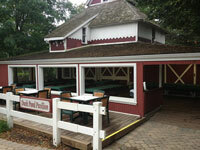 Cosley Zoo offers a preferred vendor list for those looking to have a caterer on-site during their event. Alcoholic beverages are not allowed during daytime events. If you are interested in having beer and wine at your event, please see our evening rental options. Add a special visit from our animal ambassadors to your event. Your guests will have an opportunity to see the animals up close and might even have an opportunity to touch some of them as well. Additional fee applies; please see the specific rental space for the animal visit option. Animal visits must be scheduled at least two weeks prior to your event date. Pets/outside animals are not allowed on zoo grounds. Music and entertainment (face painters, magicians, etc.) are permitted with the approval of the zoo and may need to provide a certificate of insurance naming Cosley Zoo as additionally insured. Time for set-up has been included in the rental fee. 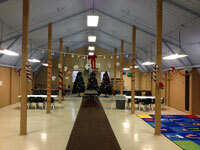 Please see the specific rental space for exact amount of set-up time included. If you need additional time for set-up, you must book this in advance with the rental coordinator. Additional fees apply. Free-standing and table top decorations are recommended. Thumbtacks, tape, or nails are not permitted on walls, ceilings, buildings or trees. Time for clean up has been included in the rental fee. Please see the specific rental space for exact amount of set-up time included. If you need additional time for clean up, this must be scheduled with the rental coordinator in advance. Additional fees apply. Cosley Zoo has limited public parking. We ask that you encourage your guests to carpool when possible. If parking is a concern, additional parking may be available depending on when your rental is scheduled. Please contact the rental coordinator for additional information. Valet parking may be required, see specific rental details.